Staircases can grace the inside of a house and even display craftsmanship. But for seniors who want to continue living in their own residence, staircases can rank as the place where most accidents occur in the home. One safety measure according to Tamara Kato of Comfort Keepers in Arcadia, California, includes using light sensitive night lights in unlit stairwells, hallways and placing light switches at doorways. 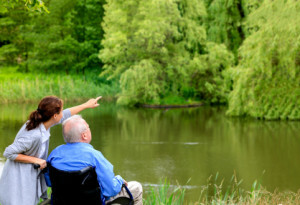 Having the same caregiver consistently who interacts and consults with seniors on a variety of issues is beneficial not only for safety but also for the overall quality of life in and around a house. A skilled caregiver will learn the daily habits and routine of the person they’re watching and then they’ll be able to spot and even take action on areas that could compromise safety. o Use light sensitive night lights in unlit stairwells and hallways. o Place light switches at doors to prevent walking in the dark. o Install smoke alarms in every room and test the batteries regularly. o Use heating elements that shut off such as electric burners on the stove. o Keep fire extinguishers handy. o Only use sturdy step stools with handles and use poles for reaching. o Keep vents clean of grease. o Modify baths with tub cutaways. o Install higher toilets to assist in standing and sitting. o Apply non-slip strips to bathtubs. o Use shower seats with back and portable shower heads. o Paint with contrasting colors. o Keep doors and windows locked. Use peep holes. Never open your door automatically. o Notify neighbors and the police when going away on a trip. o Never leave notes on your front door. o Be suspicious of offers from unknown contractors to do home repairs. Only work with reputable businesses. Underwriters Laboratories reports that up to one million people over age 65 were treated in hospital emergency rooms for injuries associated with using everyday, household items. Tamara Kato emphasizes another area of senior safety – taking medications correctly. 33% of all hospitalizations of people age 65 and older are taking medications improperly. Don’t hesitate or feel embarrassed to ask for help in reading labels or being reminded on the correct dosages. Quality caregivers can offer help in routinely inspecting the home environment for safety issues as one part of their care offering. A range of non-medical services can help a senior not only remain in their home, but stay active and satisfied. This entry was posted in Home and Family on February 11, 2014 by admin_z.